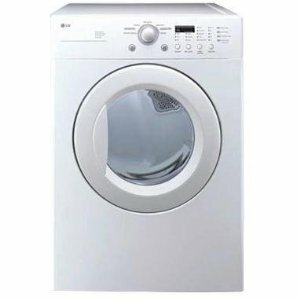 Made mainly from aluminimzed alloy steel, the LG DLG1320W White Super Capacity Gas Dryer 7.0 Cu. Ft. is fashioned in clear white to easily fit in with most home dÈcors . Equipped with 5 program levels and 5 temperature options, the LG DLG1320Wís capacity makes it ideal for larger households. Convenienve features like Child Lock and Drum Light are also present in the model. Boasts of Super Capacity feature capable of washing up to 7.0 Cu. Ft.
Comes with the Sensor Dry System for increased fabric care. Custom Program allows users to save their favorite drying cycle. Versatile unit comes with 5 temperature levels to choose from. Wrinkle Care option minimizes the need for ironing. Features 5 program levels and 3 drying levels. Wash silk and other fragile materials with the Delicates Cycle. LoDecibel Quiet Operation for a quiet washing process. The model is equipped with Child Lock for increased safety. Additional convenience features include the End of Cycle Beeper and Drum Light. Clean white design is easy on the eyes. Upfront Electronic Control Panel allows for easy manipulation of the appliance. Clear Glass door makes it easy to see the status of the clothes. Classic design allows for easy blending of appliacnes. Large capacity makes the unit ideal for large households. No need to iron shirts, save up on electricity wit the Wrinkle Care feature that constantly tumbles the clothes to prevent the settling of creases. No need to handwash delicate underwear with the Delicates Cycle option. Wash clothes at night without disturbing the neighbors using this quiet device. Sensor Dry System makes it possible for the unit to adjust settings depending on the needs of the clothes. Responsive Electronic Control Panel allows for an easy to manipulate device. Program levels include: Sensory Dry, Cotton/Towels, Normal, Delicates, Manual Dry, Speed Dry and Air Dry. End of Cycle Beeper conveniently alerts the user when the cycle is finished. Child Lock ensures that children wonít be able to interfere with the cycle. Drum Light allows for easier access even during at night. The unit comes equipped with 4 adjustable legs to easily alter positions as necessary. Save a favorite cycle using the Custom Program option and have access to it at a push of a button. The unit comes with 6 different drying time for added versatility namely: 60 minutes, 50 minutes, 40 minutes, 30 minutes, 20 minutes and More Time/Less Time. The unit is not ideal for small households due to its large capacity. The model is not Energy Star rated. Some features present in other dryers are not present in this LG model.